Shura involves bringing people together for the purpose of participating in making a decision on a course of action to take. 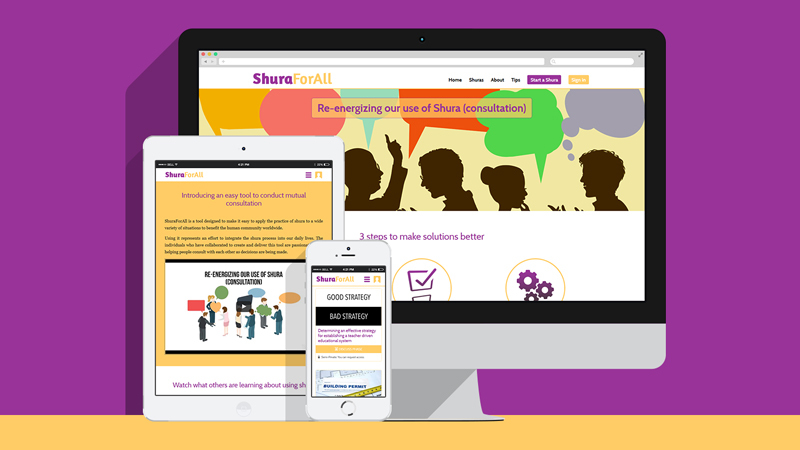 ShuraForAll is a tool designed to make it easy to apply the practice of shura to a wide variety of situations to benefit the human community worldwide. Using it represents an effort to integrate the shura process into our daily lives. Dynamisigns has put its heart and soul in designing and developing this project. The minute details that has been noted and fabricated has made this consultation platform even more user friendly. Wanna make use of Our Service? We are always ready to Serve! Dynamisigns is a top-flight professional web designing, development and marketing firm that provides innovative web solutions for small to large scale companies globally. © 2016 All rights reserved. Dynamisigns.